Since I will be on vaction starting Thursday, I am writing this T.G.I.Fabulous blog post today. When you walk in to Happenings, our store in Galveston, you will notice the amazing aroma. We owe it all to Aspen Bay Candles. We light our favorite fragrance, Volcano, every morning to make our customers feel welcome. 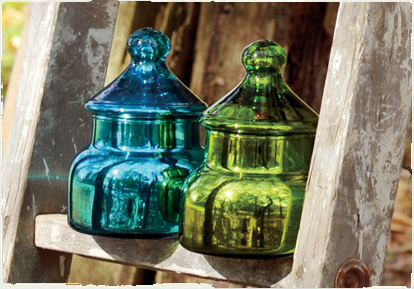 Each candle comes in a distinct beautifully hand-blown, recycled glass jar in lucious deep colors and jewel-toned metallics. We sell our signature fragrance, Volcano, from the Capri Blue collection, at Happenings. 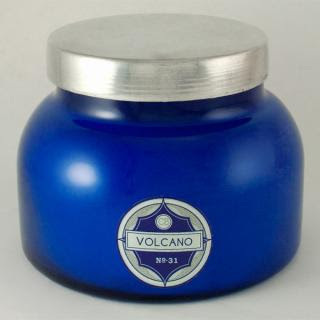 Volcano comes in a sapphire blue jar. The large jars are $25 and the chub cups are $18. 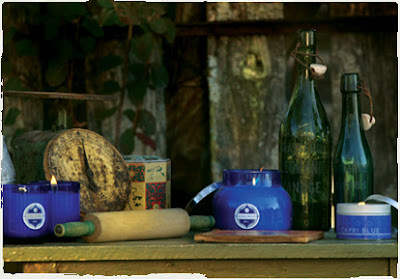 Although we do not sell the Pagoda candles at the store, Aspen Bay sells them on their website for $35. We love the metallic handblown glass. We think the jars that these tantalizing candles are set in are just as beautiful as the fragrance. Even after your candles are burned out, we discovered a way to preserve the jars and use them as containers in your home. 1. Run hot water in your kitchen sink about 4 inches deep. 2. Place burned out candles top up in the water for several minutes, until soft. 3. Scoop out melted wax with a spoon and place in a plastic bag. 4. Use warm soapy water to remove excess wax and oxidation. 5. To remove lables, use Goo Gone. Goo Gone can be purchased at Target or Wal-Mart. 6. Don't forget to save the lid! **DO NOT MICROWAVE CANDLES. The wick contains metal. We wouldn't want you to break your microwave! We placed bathroom essentials like Q-tips and cotton balls in the old Aspen Bay Candle jars. You can place anything in them that you would like! We hope you stop by Happenings to check out our Aspen Bay Candles and other goodies! 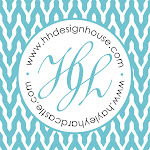 Don't forget to add us on Facebook and visit our website. Have a wonderful week!